Game Of Thrones has ruined Game Of Thrones for me. More specifically, the Game Of Thrones TV series has spoilt George R.R. Martin’s A Song Of Ice And Fire for me. It’s not just the fact that Martin has been taking so long to finish the series that the TV show has reached the endgame faster than the books. While it would have been great if the author had finished Winds Of Winter (seven years and counting!) faster, the fact is the series had long overtaken the books, and he probably wouldn’t have wrapped it up with the next book anyway. No, my main gripe about Game Of Thrones is that now my perception of Martin’s characters is tainted by the series. When I read about Jon Snow now, I picture Kit Harington in my head. Likewise, Emilia Clarke’s face is now permanently attached to anything Daenerys-related, and when I read about Tyrion, it’s inevitably Peter Dinklage’s face that comes to mind. I also reckon that reading Winds Of Winter would be a vastly different experience now, as most of my opinions would now be tempered and informed by what happened in the TV series. Maybe that’s why I found reading Fire And Blood such a fascinating experience. Chronicling a period of time that is way, WAY before the events of A Song Of Ice And Fire, reading it felt like a liberation of sorts from the chains of the HBO series. Here were characters that were mere mentions in the show, not made flesh by any actor and thus allowing readers to form their own opinions and images about them. Unlike A Song Of Ice And Fire, Fire And Blood is a chronicle of the Targaryen kings and queens of old. Simply put, it’s a complete history of House Targaryen, from Aegon the Conqueror, the first Lord of the Seven Kingdoms and king on the Iron Throne, up to the end of the Regency of Aegon III for now (a second book is coming up with the rest of it). Considering Aegon’s conquest of the Seven Kingdoms (of which he conquered all but one), happened some 300 years before the events of A Song Of Ice And Fire, there is a lot of history and backstory to go through here. Fire And Blood has been called Martin’s version of J.R.R. Tolkien’s The Silmarillion, but that would be an unfair comparison. The Silmarillion is a compilation of material Tolkien wrote about the early years of Middle-Earth, way before events in The Lord Of The Rings. Fire And Blood is about just one family – a hugely important family in the world of Westeros, no doubt, but still just one family. As fascinating as it is to learn just how Aegon I created the Iron Throne and made his two sisters his queens, or the violent ways in which Maegor the Cruel destroyed his enemies, the dry narrative style of the writing does make this a rather difficult read. And that’s not even considering the fact that the book is immensely thick and heavy, which makes it a real back-breaker especially if you’re the sort that likes to read while on the go. 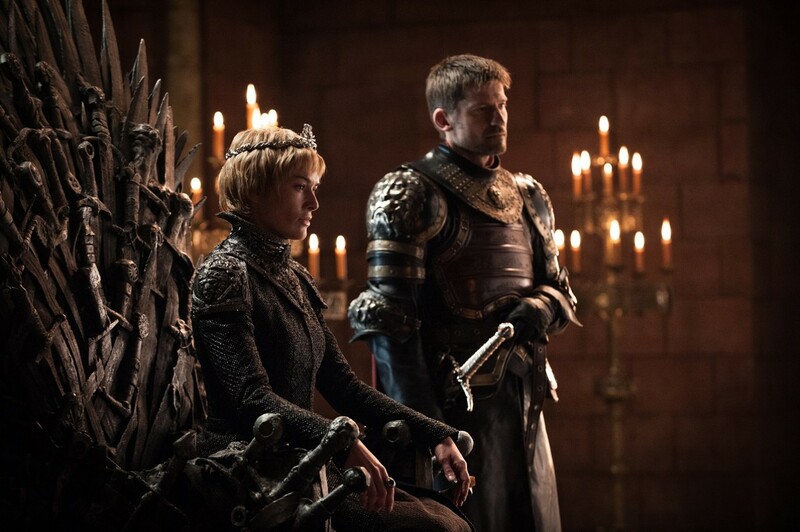 Aegon The Conqueror and his two queens atop the Iron Throne. Illustrator Doug Wheatley’s drawings are a highlight of the book. One aspect of the book I do like tremendously is the stellar work by illustrator Doug Wheatley, who produced some beautiful black and white drawings of the various events in the book. If they ever decide to make a movie or TV show out of this, I hope the producers use his drawings as their main point of reference. The main question I had before (and while) reading the book was: Is this going to improve my Game Of Thrones experience? Will this add more to the already complex and rich world of Westeros, and give Martin’s world more depth? While it undeniably does add more depth and story to the history of Westeros, Fire And Blood unfortunately isn’t exactly required reading if you’re a fan of the books or the TV series. Do we really need to know which handmaidens were sent to Dragonstone to accompany the queen? Is knowing which minor house was destroyed by dragons really necessary? There are so many details in this book, yet many of those details are rendered meaningless by the simple fact that so much of the information doesn’t really matter in the greater scheme of things. Sure, while reading the book, I did find myself thinking about how the history of the Targaryens might actually influence the events in the TV show, and even formulated my own theories about how the game of thrones might play out in the end. Whether those theories will come true and whether the outcome will be the same for TV and book series, only time will tell. In the meantime, hey, at least I can tell you where Daenerys’ dragon eggs came from.